Marina hours are 7am to 5pm and the park hours are 7 am to 6 pm. We just had a 2900 lbs. fish and game trout plant on Tuesday,December 7 and a 1000 lbs. Mt. Lassen Trout plant on Thursday, December 9. Our Trout fishing has been amazing. The water temperature is about 53 degrees. Shore fishermen and boaters alike are pulling out their limits. Our trout fishermen have been using a variety of bait such as Power Bait Eggs in White and Green along with Berkley Gulp Floating Worms in Fluorescent Pink and Green, Powerbait in White, Rainbow with Glitter, Orange Twist with Glitter, Lemon Twist,Powerbait Corn, Blue Fox #2, Kastmasters, Rupalas and Super Dupers, Walley Divers, Berkley Power Bait Trout Dip in corn and Garlic,Berkley Power bait Trout Attractant Potion and Night crawlers have all been the number of fishermen rise. Large Mouth and Small Mouth have had a few pulled out using Crank Bait and Plastic Worms. Striper fishing has slowed down some but the bait of choice is still Anchovies, Sardines and Night Crawlers. As a reminder, we have a half off special on all boats on all day boat rental every Wednesday. 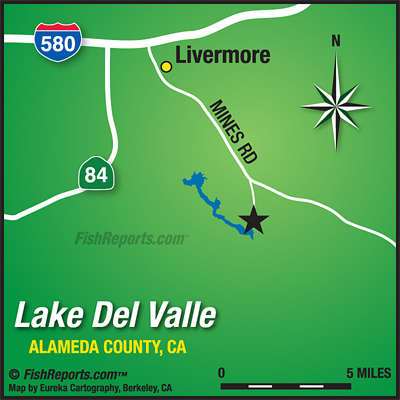 Rodney Salsedo of Livermore caught his limit of 5 Trouts near the East Beach trolling with Night Crawlers on 12/05/10. George Veloz of Fremont caught 3 trouts the largest weighing 4 lbs. at the East Beach using Power Bait corn yellow on 12/05/10. Ron Cruz of Vallejo caught his limit of 5 Trouts the largest weighing 5 lbs. 5 oz. in the Lower Narrows using a Walley Diver on 12/05/10. Trystan Clark of Livermore caught his limit of 5 trouts the largest weighing 7 lbs. uisng Power Bait Corn Yellow with Trout Attractant at the Dam on 12/05/10. Derek Hefelfingr of Livermore caught a 7 lbs. 8 oz. trout using Night Crawlers across from the East Beach on 12/05/10. Tia Sorgdrager of Livermore caught a 5 lbs. 7 oz. Trout using a Super Duper in the Narrows on 12/06/10. Debbie Weber of Modesto caught 3 trouts the largest weighing 9 lbs. 2 oz. using Power bait Green eggs with trout dip in garlic in the Upper Narrows on 12/07/10. Suzette Mortini caught 2 trouts. The stringer weighed 8 lbs. 15 oz. with the largest weighing 7 lbs. 15 oz. usng Power bait at the East Beach on 12/07/10. Jonathan Davis caught a 6 lbs. trout using night crawlers at the Dam on 12/09/10.